The following 15 Lots are from the collection of John Alexis Mardas, a.k.a. Magic Alex. Acclaimed as a science prodigy from his teens, Alexis Mardas moved from his native Greece to England in the early 1960s. He met Brian Jones of The Rolling Stones around 1963, and was subsequently commissioned to design a revolutionary new system of linking lights with sound for the band's stage performances. In 1966, he met John Lennon, who was so impressed by his scientific skills that he dubbed him 'Magic Alex', and often referred to him as "my guru". The Beatles were in the early stages of forming their Apple empire, and Mardas was installed as the head of Apple Electronics. He continued his experiments with audio-visual technology until the company fell foul of Apple's cost-cutting crusade in 1969. During this period, he was arguably one of Lennon's closest friends outside the Beatles. Lennon was the best man at his weddding; and Mardas accompanied the group on many of their global adventures, including their trips to Greece and India, and the filming of their Magical Mystery Tour. Even after Apple Electronics was closed, he remained friends with both Lennon and George Harrison, and John and Yoko continued to travel to Greece to holiday with him. Since leaving the Beatles' employment, Mardas has continued to work in many different fields, not least as a security consultant to many of the crowned heads of Europe. Provenance The Collection Of John Alexis Mardas. Lot Notes Inner Light is the b-side to Lady Madonna, released in 1968. 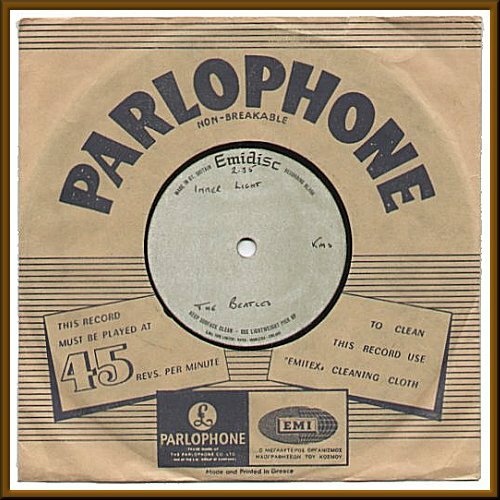 Sour Milk Sea, written and produced by George Harrison, was performed by Jackie Lomax, and was one of the first four Apple singles released in 1968. April 2004 then again in eBay in June 2004. See the auction descriptions below. 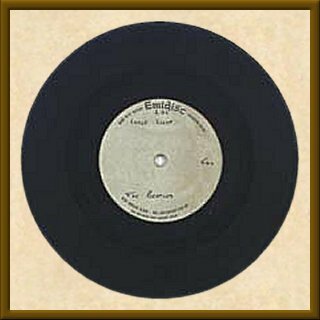 An original single sided EMIDISC acetate for the 1967 Beatles song "Inner Light. . Label features handwritten text and reads "Inner Light KMS The Beatles", also timing "2.35" written in black ballpoint pen. Very good minus condition. Several light scratches over the surface. This acetate came from the collection of John Alexis Mardas (Magic Alex) who worked for Apple in the 1960s and was a close friend of John Lennon.